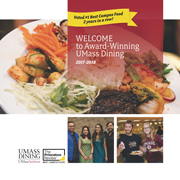 Whether you know a little or a lot about UMass Dining, this comprehensive guide is sure to teach you a thing or two about our program. Including a map of campus dining locations, hours of operation, job opportunities, special events, meal plan overviews, and more! Recipes are about more than just mixing ingredients in a bowl. They are traditions handed down over generations. They are mistakes in the kitchen or a work of imagination that turns into something delectable. Recipes represent family time, traditions, togetherness and community. Each year, UMass Dining releases a new edition of the Taste of Home Cookbook, filled with recipes submitted by parents, friends, and family members of our students.